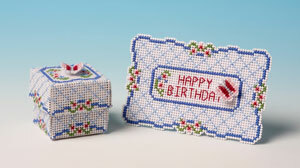 The Small Gift Boxes are ideal projects if you want a fairly speedy result. When complete, you can give it to a friend or loved one or keep it yourself. The kits all contain perforated paper, backing card, thread, needle, thread card, tissue paper, chart and full instructions. Both the Nutmeg Guide to Stitching on Paper and the Butterfly Box which matches the card in the booklet.